The Research & Planning section of the Wyoming Department of Workforce Services reported today that the state’s seasonally adjusted unemployment rate fell from 4.0% in January to 3.9% in February. Wyoming’s unemployment rate is down slightly from its February 2018 level of 4.0%, but is slightly higher than the current U.S. unemployment rate of 3.8%. Almost all county unemployment rates fell from February 2018 to February 2019, suggesting a tightening in the state’s labor market. The largest decreases were seen in Platte County (down from 4.8% to 3.4%), Converse County (down from 4.1% to 2.9%), Fremont County (down from 6.2% to 5.1%), and Big Horn County (down from 5.8% to 4.7%). Goshen County’s unemployment rate rose modestly from 3.1% in February 2018 to 3.4% in February 2019. Employed All persons who, during the reference week, did any work at all as paid employees, worked in their own business, profession, or on their own farm, or worked 15 hours or more as unpaid workers in a family business. Unemployed All persons who had no employment during the reference week, were available for work, and had made specific efforts to find employment sometime during the 4-week period ending with the reference week. Labor Force All persons who meet the criteria given above as either employed or unemployed. 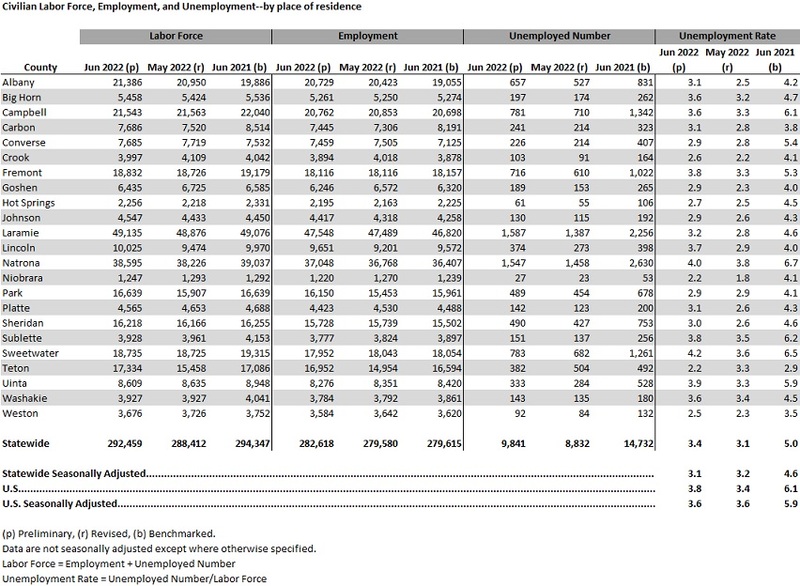 Unemployment Rate The number of unemployed as a percent of the labor force. Seasonal Adjustment A statistical procedure to remove the impact of normal regularly recurring events (such as weather, major holidays, and the opening and closing of schools) from economic time series to better understand changes in economic conditions from month to month. Not seasonally adjusted data reflect the actual economic conditions in a given area for a given time period. These data show the normal seasonal changes that occur in the economy. Most county unemployment rates are higher in the winter months because of seasonal job losses in construction, leisure & hospitality, and many other sectors. Similarly, most county unemployment rates are lower in the summer months as employment increases across the economy. Data users should use caution when comparing not seasonally adjusted data for different months, as at least part of the difference between months may reflect normal seasonal patterns. In contrast, seasonally adjusted data have been subjected to a statistical procedure to remove the effects of normal changes that occur in the economy each year, such as seasonal hiring in the construction sector, the opening and closing of schools, and holiday hiring by retail trade establishments. There is no expectation that seasonally adjusted unemployment rates will be higher or lower in any particular month, except as the economy expands or contracts. The value of seasonally adjusted data is that it is easy to identify longer-term trends in the data and valid comparisons can be made between any two months in the series. Research & Planning works in cooperation with the Bureau of Labor Statistics to develop and publish unemployment rates for each county in Wyoming. However, these data are not seasonally adjusted and therefore reflect seasonal changes each month.